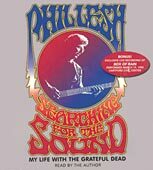 In the epilogue to his autobiography Searching for the Sound: My Life with the Grateful Dead, Phil Lesh acknowledges that there is a myriad of books that already have been written about the history of the Grateful Dead from a variety of perspectives: management, road crew, and historical-scholars, among them. For certain, reinventing the wheel was not his intent. Granted, he touches upon all the familiar peaks and valleys of the band’s legendary career — the Acid Tests, Woodstock, Altamont, the thieving managers, the Bourbon Street bust, the superlative European tour of 1972, the trip to Egypt, and Jerry Garcia’s diabetic coma, for example — but he does so in a rather superficial fashion, adding little to what is already known about these events. As for the minor stops on his sojourn through the past, he also readily admits on more than a few occasions that he simply doesn’t recall the specifics of what happened. What makes Searching for the Sound such a fascinating tale, then, is the manner in which it is told. Simply put, while the factual details are important, it’s the anecdotal commentary that brings Lesh’s story to life, and the classically trained composer-turned-bass-player provides enough context for his contemplations to give them more than enough heft. Utilizing the history of the Grateful Dead — with a particular emphasis upon its early years — as a backdrop, he provides an inside examination of both himself and the band, and his depiction is, not surprisingly, portrayed from an intellectual perspective. His first impression of both Jerry Garcia and Ron "Pigpen" McKernan, for example, was how closely each resembled composer Claude Debussy. Indeed, throughout the book, Lesh approaches everything with an analytical eye, and as a result, he essentially provides a cerebral dissection — albeit one that is wrapped in a wealth of emotion — of the phenomenon known as the Grateful Dead. Of its formative years as the house band for the acid tests, he not only waxes philosophically about the manner in which the ensemble forged its unique style, but he also ruminates upon such things as the nature of reality. There are moments, too, when Lesh dips, however briefly, into scholarly discussions of the music itself, and while mere mentions of diminished chords and root notes might make some fans yawn in boredom, it’s a small price to pay for the greater good of the narrative. Much as its title suggests, Searching for the Sound is about Lesh’s lifelong quest to find the chords that unlock the intertwining secrets of both music and life. This he makes clear in the second paragraph of his book when he writes: "Music can define life itself, and it has indeed defined my life. In life, as in art, there are recurring themes, transpositions, repetitions, unexpected developments, all converging to define a form that’s not necessarily apparent until its ending has come and gone." Yes, there are times when Lesh’s pursuits were interrupted, largely by his and his collaborators’ consumption of non-psychedelic drugs — specifically, alcohol, cocaine, and heroin — and he gives his frank and honest opinion along with a tinge of regret about the problems that so haunted the Grateful Dead that they prematurely swiped three keyboard players as well as the band’s lead guitarist. "If we’d only had eyes to see," he states, "the whole Summer of Love catastrophe could have been read as a metaphor for the Grateful Dead’s future: the influx of hard drugs, the increasing isolation from and indifference to one another, the resultant failure of communication and shared responsibility." Largely though, Searching for the Sound is an optimistic and exuberantly told account of what it was like to be caught within the midst of the Grateful Dead’s maelstrom, and by writing his memoirs in a conversational tone, Lesh lends an added air of intimacy to the affair. In that sense, the narrative works remarkably well in its incarnation as an audio book, which, when read by Lesh himself, becomes all the more endearing and poignant.